The following article appeared in "The Gazette Times Home Journal" Pittsburgh newspaper around 1917. 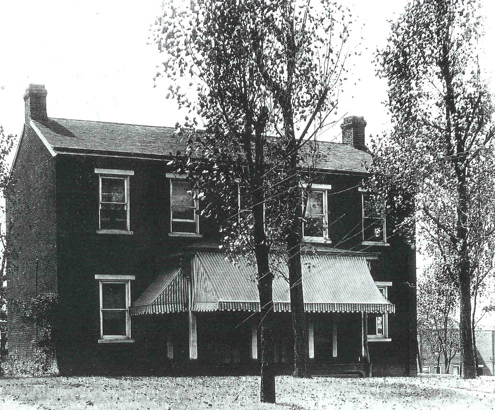 The old Ferree homestead located at 6940 Frankstown Avenue in the Twelfth Ward, is perhaps the only estate in Allegheny County that has been a family possession so long a period as 130 years. Attorney Delmont K. Ferree has just sold a portion of the old homestead for the site of a new church and in looking up the abstract of title found many interesting family documents and historical records. The Ferree's are of an old French Huguenot family. Being banished from France, Mme. Ferree who was a widow with a large family went herself to William Penn in England and asked for a tract of land in Pennsylvania. This was given her, and the family came to Lancaster County. One of her grandsons was John Ferree, who in 1787, was given a homestead of 155 7/8 acres called Fairfield in Pitt Township, Allegheny County. All land west of the mountains was at that time regarded as frontier and given to new settlers as the homesteads of the western states are given today, but instead of being 160 acres, which is the usual homestead allotment, this was lacking a few acres on account of being particularly rich in springs, there being three fine springs with running water upon the property. Besides Fairfield there was another tract of 58 acres called Green Meadows in Pitt Township (now in the Squirrel Hill district) that belonged to John Ferree, but this tract has not remained in the family name. The old deed shows the crudeness of surveying at that period, the boundaries being marked by a white oak, an ironwood, and an ash and an oak, naming the distance between each tree. 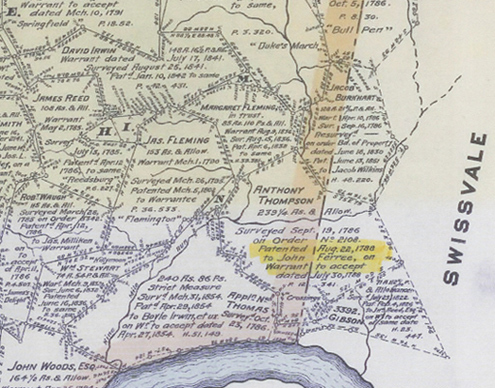 One-fifth part of all gold and silver ore that might be found on the property was reserved for the use of the Commonwealth. When John Ferree first came to Pitt Township to take possession of his homestead he found it well wooded, and there were Indians; but these strolling Shawnees usually kept to the river banks and so the Ferree stone mansion was built as far as possible from the river, which even then was only a mile away, and visits from the Indians were no uncommon thing. An interesting explanation of the term Indian summer is handed down from John Ferree, who said that the Indians were always more hostile and consequently more dreaded in the summer or when the weather was open and pleasant. In those days the first frosts came early in the fall and as winter approached the vigilant watch that was always kept for Indians was somewhat relaxed, but in November there would often be an apparent return of warm, pleasant weather when the former vigilant guard must be resumed, and this was known as Indian summer. A story is still told in the family about a friendly Indian who used to come to the Ferree house occasionally and would knock on the door and without waiting for a reply from within would say "come in" and there upon open the door. A stockade called the Bull Pen was in what is now the Point Breeze section. It was built for the safety and common defense of the settlers, and on more than one occasion this friendly Indian warned the Ferree family when there was impending danger so they might flee to this place for protection. There were soldiers always at Fort Pitt whose business it was to protect the settlers and hold the Indians in check, but the Bull Pen was much nearer than the fort. The nearest neighbors were the Negleys on the north and the Wilkins on the south. John Ferree was an aide to General John Wilkins who was in command of the Continental forces raised in Pennsylvania in the Revolutionary War and who would leave his aide in full charge of provisioning his forces and other responsible duties while he was away on active service. John Ferree died in (1815) leaving six children among whom the estate was divided, the part on which the mansion stood going to his youngest son, George Ferree. In the partition of of the land there were many amusing considerations; some of the children receiving less land than others and in recompense being given a horse and cow or something of equal value. It was in George Ferree's time that the Pennsylvania Railroad was constructed, it passing through his property. No recompense was received for the damage incurred, but upon the completion of the road all the land owners through whose property the railroad passed were invited as guests of the road to take a first ride. A flat open car was provided for the purpose of which chairs were placed. The day of the excursion all of Mr. Ferree's family were present to see him start on the hazardous journey, as well as the friends and families of the others who were going on the trip, and they all took solemn farewell of their friends as though they never expected to see them again. Mr. Ferree is said to have pulled his tall white beaver hat down over his ears as the train started and said: "This probably means heaven or hell for all of us." The third of the family to own the old homestead was B. F. Ferree, father of the present attorney Ferree. B. F. Ferree was born in 1837 and was a soldier in the Civil War, being in the Battle of Fredericksburg. He saw much other active service in the Virginia campaign.His wife, Mrs. Martha N. Ferree is still surviving and she and her son live in the fine old residence. The present house is not the old one of Indian times, however, but a more modern one, being only 80 years old. The house stands on a high knoll, with a broad veranda in front. It is surrounded by a beautiful lawn that sweeps in graceful natural lines down to the avenue. Years ago there used to be two springs surrounded by willows not far from the house, that fed an ice pond which lay between what are now Bennett and Kelley streets. In these streams there used to be good fishing and in the early days it was possible to catch a basket of fish in a very short time. Now there is not even a spring. The old English lock on the front door has a brass knob and the keyhole is fully two inches long. Throughout the house the doors are still opened by the old fashioned thumb latches. There is a very old "three cornered cupboard", an antique sideboard, a davenport, a sewing stand with glass knobs to the doors and some beautiful old chairs, all of them heirlooms of the family. This Ferree homestead "Rocky Bend" remained in the family until approximately 1915. John Ferree, son of Isaac Ferree and Susan Green, was born in 1748 and died in 1815. Lineage: John Ferree and Jane Irwin/Isaac Ferree and Susan Green/Daniel Ferree and Anna Maria Leininger/Daniel Ferree and Marie Warenbur. Photo and newspaper article courtesy of Ed Rech a great, great, great grandson.